Stocking and supply of wide variety of machinery & spare parts for Main & Auxiliary Engines, Air Compressors, Fuel Oil and Lub Oil Purifiers, Turbochargers, Pumps, Hydraulic Motors & Pumps, Boilers, etc. Sales & Service agent / distributor of H. Cegielski Poznan SA - licensee of MAN B&W and Sulzer two stroke & four stroke engines, PMAX washable turbocharger air filters, Northey gas compressors, Fluinamics Water Treatment systems, HMSA Sewage Treatment Plants, Magnus Chemicals, etc. Ark Vision is headed by a management team that has over 30 years of industry experience. The current Group Managing Director, Asothan Samynathan, was an ex-Chief Engineer with Neptune Shipmanagement Services Pte Ltd & Technical Manager with V-Grow Shipping Pte Ltd. With more than 20 years of experience, he has embarked on this business. Supported by a committed team of fully qualified & trained professionals equipped with intimate technical & operational knowledge of the marine and offshore industry, clear understanding of customers’ needs as well as end-to-end process of sourcing and supplying equipment spares to provide one-stop customised solutions for mission critical applications. Through the years Ark Vision has established a global network of equipment and component suppliers carefully selected for their genuine, reliable & quality equipment parts. We pay total attention to details of customers’ needs and can be trusted to deliver on our promise of promptness, reliability and cost-effective parts & services. 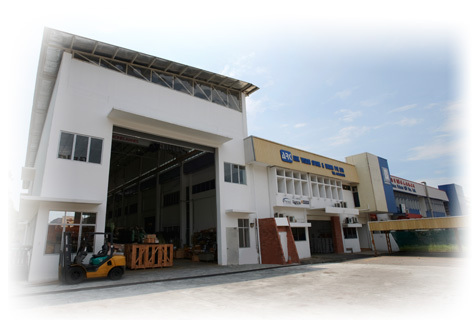 We maintain a large inventory of Genuine & OEM New and Reconditioned Spare Parts (larger components) & Auxiliary Machineries from a wide array of different engine and equipment models in our spacious Tuas warehouse to be able to respond to customer needs promptly & efficiently. We also carry complete Diesel Generator engines, Remanufactured Fuel Oil & Lubricating Oil Purifiers complete with new electrical motors, Remanufactured Air Compressors and Reconditioned Pumps, Reconditioned Hydraulic Motors & Pumps and etc. All reconditioned and remanufactured auxiliary equipment are both function and load-tested in AVSE’s workshop before dispatch. Over the years, we have built up our stock based on market demand, Hence, delivery can be accomplished promptly at cost effective prices. We provide re-conditioned Piston Crowns, Exhaust Valve Spindles & Seats as well as complete Exhaust Valve complete assembly and re-manufactured Purifiers, Auxiliary Engine Cylinder Heads on exchange basis. These have been reconditioned or remanufactured according to Makers' Instructions. Ark Vision is also proud to announce that it has a Purifier Bowl Vertical Balancing Machine in its workshop in Singapore, one of only three machines that exist in Singapore, allowing it to carry out full balancing of Purifier bowls in-house. In recent years, we have ventured to provide repair services on-board, when requested by owners or management companies. This section of business is being developed with Engineers and Technicians trained and equipped with wide knowledge base. Ark Vision is the Sales agent of H. Cegielski Poznan SA, maker of B&W and Wartsila/Sulzer two stroke and four stroke engines, in South East Asia. We are also distributor of Fluinamics (Water Treatment), GALI Group (air & hydraulic starters), HMSA (sewage treatment plants), LMF (high pressure compressors), Magnus (marine cleaning) Chemicals, Northey Technologies (oil free rotary compressors & vacuum pumps) and PMAX Filters (washable/reusable Turbocharger Air Filters). We continue to pursue equipment Maker’s representation, both as spare parts supplier and after sales service centre. We also market our own brand (Ark Vision) of Service Air Compressors, Air Dryer Units, Filters and Pneumatic Hydraulic Pumps to the Marine, Power Generation & Industrial markets in this region. With our experience and capabilities, ie, wide & large inventory of machinery and spares as well as our global network of suppliers, on-board repair experience, etc, Ark Vision can dovetail seamlessly into ship owners’ and ship managers’ Planned Maintenance programme.